Une maison sans chat, c'est la vie sans soleil. a house without a cat is a life without sun. i don't know if julia child was the first to coin this expression but i have to agree! continuing the celebration of julia child's 100th birthday, i wish to give a shout out on two books that are recent additions to the casa mouse library. both books celebrate child's love of cats, which is apparently is becoming the newest sub-industry in julia child mania. 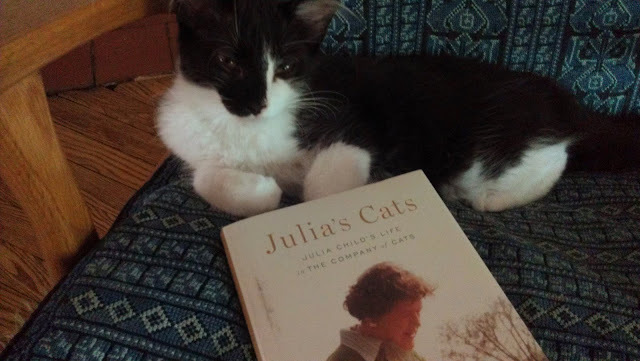 the first is julia's cats: julia child's life in the company of cats by patricia barey and therese burson. julia's cats was released earlier this month. the book chronicles julia's lifelong passion for cooking and cats and is filled with the most wonderful archival photographs of the cats that shared julia's long and luscious life. the other book is aimed at children minette's feast by susanna reich and illustrated by amy bates. this is too is a fairly new addition to the bibliography of books on julia child and cats, it came out in may 2012. although geared toward children minette's feast is purr-fect for any cat and word-loving person. Minette Mimosa McWilliams Child was a very lucky cat, perhaps the luckiest cat in all of Paris. Day and night she could hear the bells of Sainte-Clotilde tolling the hour. And day and night she could smell the delicious smells of mayonnaise, hollandaise, cassoulets, cheese soufflés, and duck pâtés wafting from the pots and pans of her owner, Julia Child. But life has not always been like this for Minette. and so the story begins of julia and minette. before we move on to today's song, one more photo - it has been eons since bingo appeared on the mouse (well truth be told it's been eons since anything new has appeared on the mouse). 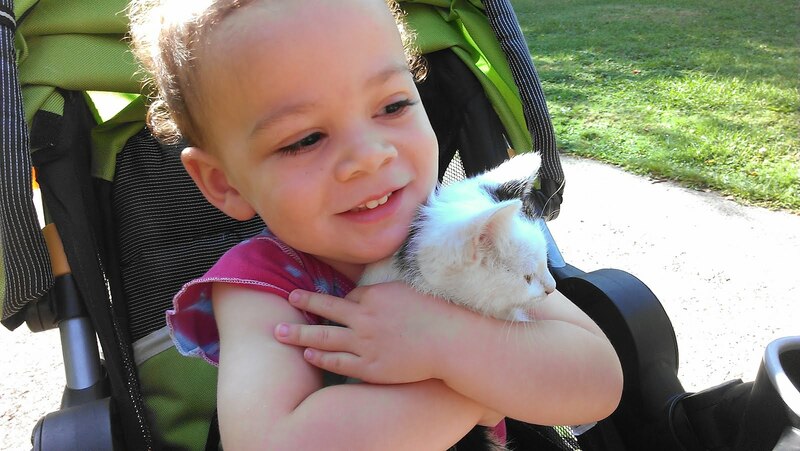 this snap was taken a couple days ago bingo is holding 'piggy' one of the kittens born to one of the feral cats than live here on avenue c which recently had a litter of kittens. many of the cat loving neighbors are working on trying to tame the kittens and one of these days we'll be successful in capturing the mama cat and taking her in to get spayed. so far we haven't had much luck with the process and the one time mama cat was successfully captured and brought in she was already pregnant - despite nursing the litter born right before this summer's brood. the kink's lyrical and fanciful song phenomenal cat, which can be found on their 1968 album the kinks are the village green preservation society. accompanying the song is an amusing montage of cat photos which was created by some youtube contributor named backwardsiris. It's amazing how quickly after giving birth cats can become pregnant again. They do not waste ANY time! I never knew Julia was a cat enthusiast. Interesting! Fun song dear kimy, and I'm presuming that none of these cats would chase or harm a wee mouse. I always learn something new on this blog. Thanks, Mouse and I am glad to see you've been keeping well even if you've not posted regularly. I'll check out the books. Bingo sure has gotten big...what a cutie.